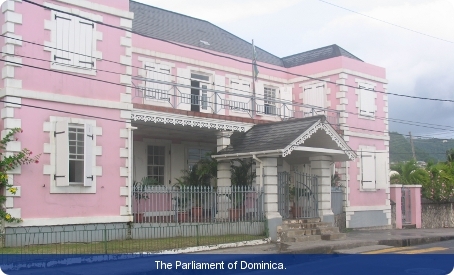 Dominica is a parliamentary democracy with a non-executive presidency. The president is head of state while executive power rests with the cabinet headed by the prime minister. The unicameral parliament consists of a 30-member House of Assembly: 21 members are directly elected and the remaining nine are senators. Five of the senators are appointed on the advice of the prime minister and four on the advice of the leader of the opposition. Elections are held every five years with universal adult suffrage. The president is nominated by the prime minister and leader of the opposition and is elected by the House of Assembly for not more than two terms of five years. The prime minister has to be an elected member of the House of Assembly. The president chooses the member who is most likely to be able to command a majority in the House. The prime minister consults the president in appointing other ministers. Roseau (the capital) and the Carib Territory have a measure of self-government. The Caribs elect their chief. The Eastern Caribbean Supreme Court was established (as the West Indies Associated States Supreme Court) in 1967 with its headquarters in Castries in St Lucia, and is responsible for the administration of justice in its member states including Dominica. It comprises the High Court of Justice and the Court of Appeal. The High Court has 16 judges, one of whom is permanently resident in the country and sits in the court of summary jurisdiction. Less serious cases are heard in district magistrates’ courts. The Court of Appeal is itinerant. The High Court’s jurisdiction includes fundamental rights and freedoms, and constitutional issues. The volcanic island of Dominica (not to be confused with the Dominican Republic), one of a string of Windward Islands in the eastern Caribbean, achieved full independence from the United Kingdom in 1978. Dominica’s national anthem, popularly referred to as ‘The Isle of Beauty’, was retained on achieving independence. Alex Marshall, writing in the Guardian (UK) in August 2008, described it as one of the top ten national anthems in the world. The Dominica Labour Party (DLP), generally considered to be Dominica’s first representative political party, was founded in 1955. In 1957 Dominica’s second representative party, the Dominica United Peoples Party, was formed under the leadership of Franklin Baron, who was also Dominica’s first chief minister. In 1961 Edward LeBlanc of the DLP became chief minister, and on LeBlanc’s retirement in 1974 was succeeded by Patrick John as both leader and premier. After the achievement of independence in 1978 John became Dominica’s first prime minister. Frederick Degazon became Dominica’s first non-executive president. In 1980 the elections were won by the Dominica Freedom Party (DFP) led by Eugenia Charles. She thus became the first female prime minister in the Americas, and she remained in office for fifteen years. In the 1995 elections the United Workers Party (UWP) was victorious. In December 2009, the DLP won 18 seats – with 61.2 per cent of the vote – and the UWP the balance of three (34.9 per cent). In early January 2010 Roosevelt Skerrit of the DLP, who had been prime minister since the death of Pierre Charles in 2004, announced his new cabinet.